Hallo! I hope you have a nice week! I am back at home, the relax was great but I need to be back in the reality. 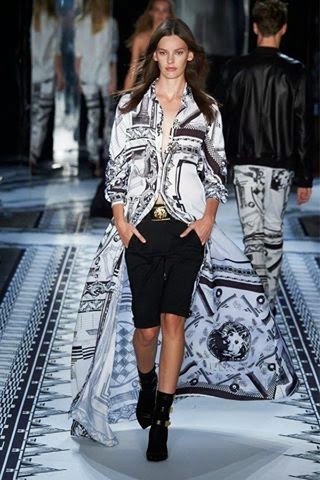 Now I have a small time and I check this amazing fashion show by VERSACE - spring/summer 2015 on the runway at Mercedes-Benz New York Fashion Week. The collection is really great. We can se most white & black combinations and I really like it. And you? Ahoj! Verím, že máte pohodový rýždeň. Ja už som sa vrátila domov a som tak späť v realite a pripravujem sa do práce. Bude to trochu viac rušné, ale nevadí. Práve si pozerá nové kolekcie a veľmi sa mi páči táto od VERSACE na jar/leto 2015, ktorá bola prezentovaná teraz na Mercedes-Benz New York Módnom Týždni. Kolekcia je naozaj vydarená a stále nám zostanú bielo-čierne farebné kombinácie. Páčia sa aj vám? The first dress is incredible!! I love every bit of it! This was a beautiful collection! Stylish and chic looks! Have a successful day dear! This is a wonderful collection indeed, Donatella did a great job as always. I particularly appreciated the long dressed with the beautiful silk lining. Gorgeous looks! Thank you for sharing! Wow, Versace is totally upping their game! Love everything!